2. Have the lavender “on the side” so you can mix the lavender in yourself and get just the right amount of aroma for you. 3. Opt for no lavender at all. 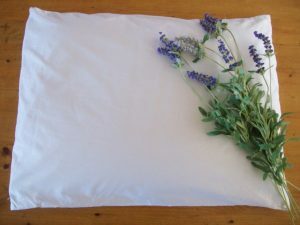 A lavender pillow is a very nice aromatherapy option and coupled with the comfort of buckwheat hulls, it’s hard to beat. Organic buckwheat pillow. Lavender flowers for photo display only. In addition, when you buy an Organic Buckwheat Lavender Pillow handcrafted in Maine by L-OMA™, your purchase will help persons with disabilities. L-OMA™ is the online store for the Bridges Foundation, a non-profit charity organization whose mission is to provide support, self-sufficiency education, social and work experience for persons with disabilities.